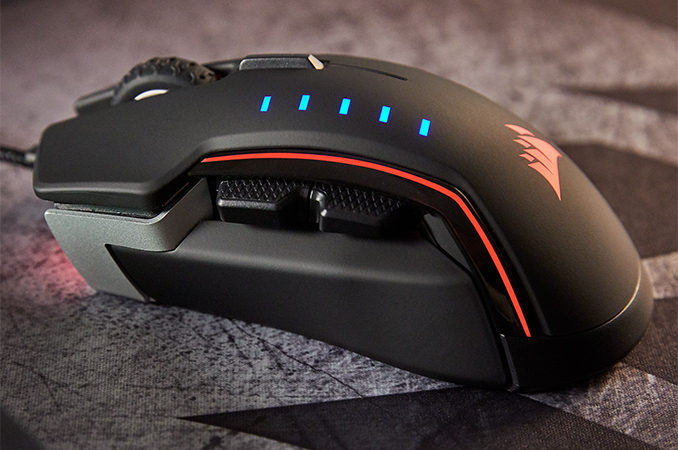 Corsair this week released its latest flagship gaming mouse, the new Glaive RGB. The company's latest right-handed mouse incorporates a new sensor, interchangeable grips, programmable RGB lighting as well as on-board storage for profiles. And, as you'd expect for such a mouse, Corsair is aiming solidly at the high-end market, going after gamers looking for a high-end wired mouse. With the rise of PC gaming in the recent years, multiple companies have entered the market of gaming peripherals with mice, keyboards, headsets and other gear. As a result, the choice of gaming hardware in general and mice in particular became a complicated task as various devices feature different ergonomics and performance. 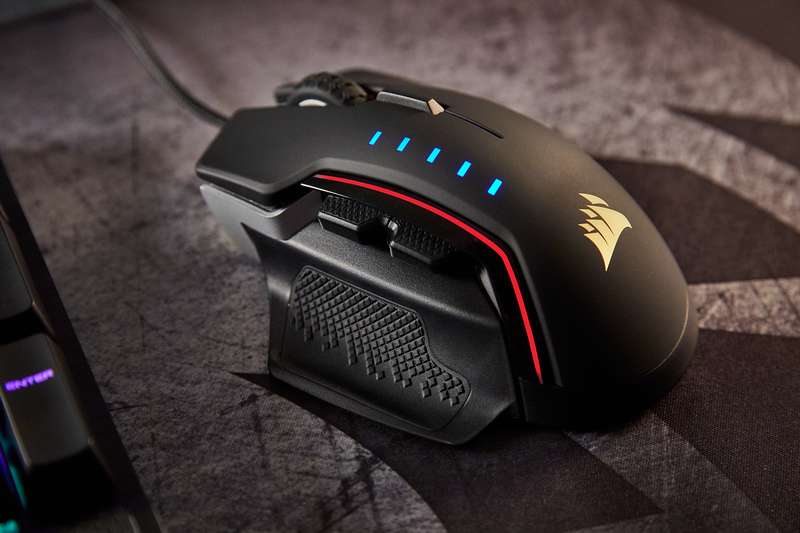 With its new flagship Glaive RGB mouse, Corsair decided to somewhat simplify the choice: the Glaive RGB uses a rather advanced and sensitive IR sensor, and pairs that up with three interchangeable magnetic grips. The smooth, the rubberized and the wide thumb rest grips were designed to allow the mouse to be used with different types of hands and usage models, enabling the Glaive RGB to compete against various rivals with diverse shapes. 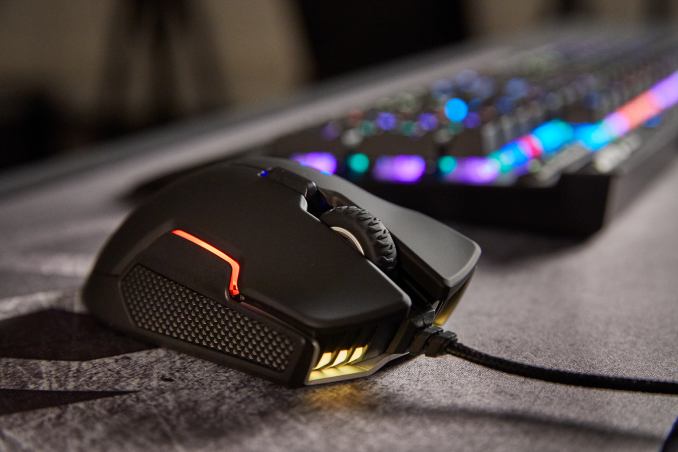 To customize the look of the mouse further, Corsair equipped it with three RGB LEDs that can be programmed using the company’s proprietary software. The Corsair Glaive RGB is based on a custom version of Pixart’s PMW3367 gaming sensor with adjustable sensitivity and up to a 16,000 DPI resolution (acceleration supported at that DPI is unknown). The microcontroller of the sensor supports USB report rate of up to 1000 Hz (programmable and requires support from the OS) and the mouse comes with a braided fiber cable. 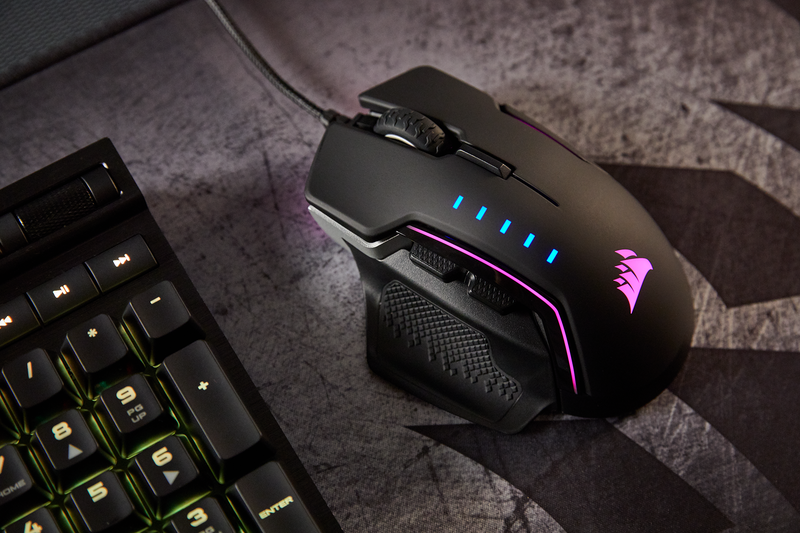 Just like any other high-end mouse for gamers, the Glaive RGB has programmable buttons that can be completely remapped using Corsair’s CUE software, and then used on different computers as button configuration is stored inside the mouse. Besides, the onboard storage is used to store DPI, macros and RGB LED settings. As for the build, the Glaive RGB mouse features metallic skeleton and is made of rubberized plastic. Depending on the version of the mouse, parts of the metallic skeleton that go outside the body are either painted or not. Corsair’s Glaive RGB mouse is now available directly from the company as well as its resellers worldwide. In the U.S., the Glave RGB costs $69.99, whereas in Europe gamers will have to pay €79.99. Wow 2/10 not enough RGBs. It only has 3 RGBs, I expect at least 10 RGBs on my gaming peripherals. Honestly, though, this thing is a brick. 122 grams without the cable is ridiculous, and I think the industry should start getting away from ridiculously heavy mice, and more mice should weigh ~90 grams and include some weights very close to the sensor like the G403 does. Well, but why would anybody actually need to use 12,000 or 16,000 DPI? Maybe if you had severe arthritis or RSI and a 7680x4320 desktop resolution. For most people, even on high resolution displays, 3200 DPI is plenty. Even at high DPIs, especially for first person games but not exclusively, a lighter weight is objectively superior unless you have serious movement stability issues. A lighter weight mouse requires less force to initiate movement and less force to stop movement, which is less fatiguing overall. A lighter weight mouse with a weight adjustment system would also accommodate a larger group of people, such as those with high sensitivities (<10"/360) and lower sensitivities (>20"/360). I was mostly replying to your opinion on how objectively better lighter mice are.